Soon as of late with windows preview I can no longer install updated due to an app. Well if I upgrade from a disk it shows me it's because of Easy CD creator. I haven't had that program installed in years and no add/remove not even Revo sees it. I went through all files and folders looking for roxio and even regedit. What am I missing to get this program out of the computer for good. What version of Easy CD Creator did you once have installed? What update(s) are you trying to install? What do you mean by "upgrade from a disk"? -I'm thinking that if you and Revo can't see a Creator installation, it might be that you still have an old driver in your system which needs to be identified and removed - but I can't tell without those questions answered, especially the first and last one if you don't mind. I have had multiple versions installed over the years, the last version was nxt (first version) The version on windows is windows 10 Preview 16296 Fall Update. windows update just throws an error code. If I burn the windows upgrade iso to disk and run it, that is when it tells me Easy CD creator needs to be uninstalled manually. I thought the "Fall Update" was due out today, not 5 days ago when you started this topic? Could you be having problems with one of the Windows Insider builds? In any case, the exact error message is needed if we're to get a handle on this. Yes it was 5 days before the Fall release because I am an insider. The Error code is 0xc1900208 which is generic for an app is in compatible. Now I run the upgrade from a cd it tells me easy CD creator. I will try to get a screen shot if need be. But what I really need to know is what reg keys to delete to remove the program for good. Now I run the upgrade from a cd it tells me easy CD creator. I will try to get a screen shot if need be. But what I really need to know is what reg keys to delete to remove the program for good. I have a few suspicions what it might be, but it looks as if you have been progressively adding and removing software over the years. If you don't clean your system "back to the bare metal" occasionally you can end up with all sorts of fragments in there. That screen shot is likely to be our best lead toward the offending piece of program. Here is a screen shot it doesn't tell you much. Sorry I'm late to this discussion. That message may be in error because the name is wrong. No Roxio program have that name.although there are several iterations of that name. Did you have any other similar programs? . Download and run the free trial of REVO Uninstaller PRO Run it in the Moderate Mode only. Use the search function to search for Roxio. It will look for the built in uninstaller and then search for and list items in the registry and then folders. You can select to remove only what you want that is listed. Microsoft may be trying to cover all their bases with that inclusive description, since Easy CD Creator, Easy CD & DVD Creator, and Easy Media Creator all used drivers and systems which were later declared "in conflict" with Microsoft's. However you're right, bs2000atsf, the screen shot doesn't tell us much. Your Windows Event Logs and error logs will probably have the precise name of whateveritis that Windows is objecting to, but finding the precise log entry can be an epic task. It's most likely to be a driver belonging to one of two systems that Adaptec and later Roxio used. 1. CDR4. These drivers were usually found as CDRVSD.sys; CDRALWNT.sys; CDRALW2K.sys; or CDR4_XP.sys, or similar names. 2. Direct CD or Drag-to-Disk These used mainly PWD2K.sys; UDFREADR_XP.sys; CDUDF_XP.sys; and DVD_2K.sys, or similar. The thing that puzzles me is that you've had insider versions of Windows 10 running on your system before now, yet it seems that only the latest version has complained. That would be very strange since Windows 7 has been complaining about those drivers since way back. ok i have deleted most of those before however I did find UDFREADR_XP.SYX, CDUDF_XP.SYS AND DVD_2K.SYS so got those files deleted. I emptied the trash bin and restarted. Guess what same error. Okay, that file list I gave was from memory and it has been a long time . . . Since you couldn't specify which version of Creator may have left the "objectionable" fragments, I went back and ran a clean XP and installed Easy Media Creator 9 in it. EMC was the last version to have Direct CD in it, and the files you found are part of Direct CD. PxHelp should be fine since Creator NXT6 in Windows 10 is still using that system, but removing any of the others that you find might be very helpful. Thanks Brandon I did find the CDRAl.dll file and deleted however program is still found. Like I said the last version I had install was the Roxio NXT suit. This has got me perplexed! (good word, that). Without your system on the bench where I can poke a stick at it, we're reduced to guessing about the problem, and I hate guessing. -The drivers you did find and dig out came from Direct CD, alias Drag to Disc, and that software was not provided after Easy Media Creator 9 around 2006, so how did that get in there, and when?? -It won't be from any of the NXT series Roxio Creators because I've had them all running happily in Windows 10. Now the updater knows exactly what if doesn't like, but hasn't told us any detail. It should have written that detail in a log somewhere. Can you find the updater error logs? They're likely to be in a folder called $Windows.~BT or similar. Alternately the Windows Event Logs might show what happened. [Go to Settings in Win 10 and type "event" to view the event logs] But I think the updater logs would be more useful. Can you find them, zip them up, and attach them here? 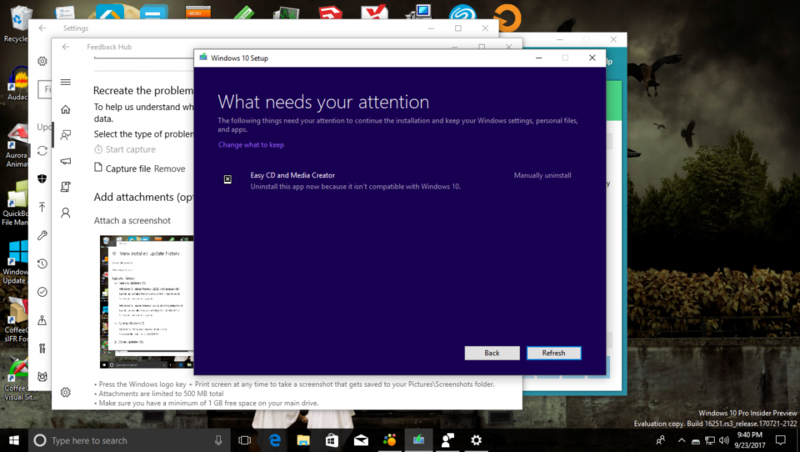 Have you looked at ALL the error messages caused by Windows 10 Fall update. There are a lot of them including problems with video and audio editing. Here is just one set of issues (link). bs2000atsf, I zipped up that log and re-attached it for you. You don't say which log it is, and it doesn't say anything about Creator software causing an abort and rollback, so it's not helpful to us. Can you find a log which identifies the reason it stopped the installation? And can you re-post that screen shot with the error, please. We have a particular error pointing to Creator software preventing the Windows install. Pointing out other things which might go wrong is off-topic and leads to red herrings. Brendon, Sorry I thought it was germaine. or at least thought provoking. or at least alerting people to install problems with W10 Fall edition. The next question is does the full; not the preview Windows 10 Fall update report the same issue? he does the new Fall Update (1709) from the MS website "windows10upgrade9252.exe"
Before you get distracted with other things, can you re-post that screen shot with the error, please. here is a zip of two log files. Did some digging too and seems the last Easy Cd Creator I had was 7. Then went to the NXT Pro. Thank you for the logs and the screenclip. The logs didn't help, unfortunately. They didn't cover the attempted Windows 10 insider's preview update, and didn't mention anything about Roxio files. Working on your guess that 7.x was the last version of ECDC that you had, I installed a fresh Windows 10 x86 version 1709 and then installed Easy Media Creator 7.5 into it. That was interesting, since Windows 10 didn't complain about Drag to Disc 7.5, and it looks really weird seeing the big Drag to Disc icon in Windows 10. Anyway, ECDC installed these Roxio/Sonic drivers. There are a couple different from those I found in the earlier D2D, and it might be worth your while to hunt and remove them. I don't know, since the latest Windows 10 didn't complain about them. The last suggestion I can make is that it might be something in that particular preview version of Windows 10 which is causing this difficulty. It apparently didn't show in your earlier versions, nor does the latest public Win 10 upgrade complain about the ECDC 7.x drivers. Check with the Windows Insiders' forums to see if the enthusiasts there can help. I regret it, but I'm out of ideas.